“I didn’t define myself as a peacebuilder, but I guess we’re all peacebuilders,” says Min Goo Kang. That’s one of the most significant things he learned at the 2017 Canadian School of Peacebuilding (CSOP). A minister at Fort Garry United Church in Winnipeg, Kang first came across the CSOP through a brochure. In his first week at the CSOP, Kang took Expressive Trauma Integration: Caregiving and Conflict Transformation with Dr. Odelya Gertel Kraybill, a leading trauma therapist, researcher, and consultant, with experience as a trainer with the UN in the Philippines, South Korea, China, and Japan. 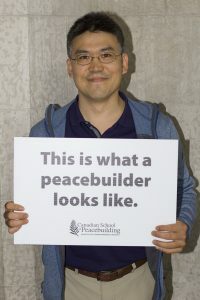 In his second week at the CSOP, Kang took Practices for Transforming the Peacebuilder, with Dr. Ron Kraybill, a peacebuilding consultant with over 30 years of experience, including most recently six years as Senior Advisor on Peacebuilding and Development for the UN in Lesotho and the Philippines. Originally from South Korea, Kang and his family moved to Canada in 2007 to pastor a church on Vancouver Island. The language barrier was tough to overcome, he says, but he came to a place where he could express himself and understand others, not limited to the use of words. In 2014, Kang’s wife got a call from The United Church in Meadowood in Winnipeg, and he followed.